Marlin Spikin’ Miller was set to sea today! 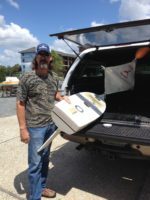 Marlin Spikin’ Miller landed on a beach in Hatteras on May 26, and a surf fisherman called in a “capsized vessel on the beach” to the Hatteras Inlet Coast Guard Station. Preparing for the worst, the Coasties were pleasantly surprised to find a ‘toy boat.’ Thankfully, they treated it as a perfect training exercise. Kudos to the Hatteras Inlet Coast Guard Station! She’s back!! What a way to celebrate World Oceans Day. Thanks to Barry York for picking up Marlin Spikin’ Miller and bringing her home. She’ll get a new coat of bottom paint, and be re-deployed next week during the MSC 114 Training Cruise to Beaufort, NC. 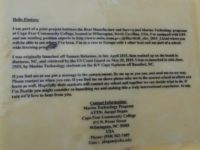 She was redeployed off the R/V Cape Hatteras off Beaufort, NC by CFCC students. The Marlin Spikin’ Miller is only 50 NM from Dingle, Ireland. 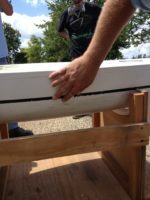 It’s currently in a race with the Carolina Dreamer, a mini-boat deployed on May 19, 2015 by the St. Andrew’s School of Math and Science of Charleston, SC. We have both been in contact with the Harbor Master in Dingle, and he’s keeping an eye out for the mini-boats! We will be contacting the local schools to see if a school group or class will help fix her up, and the Marine Institute to see if we can hitch a ride on one of their research vessels on their upcoming cruises offshore. THANK-YOU so much to the Connemara Smokehouse and the Roberts family!! 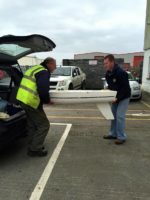 These pictures just arrived from Saoirse and Graham Roberts of the Connemara Smokehouse. 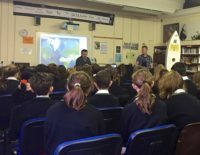 The Marlin Spikin’ Miller visited St. Callins National School in Aillebrack, where 36 students, aged 4 to 13 years, got a chance to hear about the mini-boat’s journey. As seen in the photos, all the kids were very interested! As of right now, we have secured a redeployment trip on the R/V Celtic Explorer, with the help of Ciaran O’Donnell at the Marine Institute on March 18th. They’ll be heading to the Porcupine Bank up to the Rockall Trough for a blue whiting acoustic survey. Check out the news link describing his work. Until that point, we will still search for other deployment vessels, since we want the Marlin Spikin’ Miller to head south and not back on the shores of Ireland (although it seems to be having lots of fun there!!). 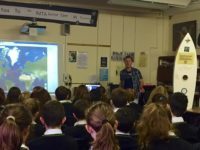 Twenty-five students, aged 4 to 11, at the Ballyconneely National School were tickled to have a visit from Graham Roberts and the Marlin Spikin’ Miller. They will be writing letters to put in the hull for its next voyage! Thanks so much to Graham and Saoirse at Connemara Smokehouse for sharing the Marlin Spikin’ Miller with the kids! Students (12-13 years old) at the Clifden Community School got a chance to hear about our mini-boat’s journey this morning. There was plenty of interaction with these students. They had a lot of questions which Graham answered with the back up of Gerry Claffey (Geography Teacher), MarieAnne Hunter (Geography Teacher), Irene Conneely (Geography Teacher), Monica Seery (History Teacher) and Anna Ryan (History Teacher). The Marlin Spikin’ Miller will be heading to Galway next week to be delivered to Ciaran O’Donnell at the Marine Institute, and eventual redeployment on the R/V Celtic Explorer. Thanks again to Graham and Saoirse Roberts of the Connemara Smokehouse! A fond farewell for the Marlin Spikin’ Miller! Graham and Saoirse Roberts, and their children, bid adieu to the Marlin Spikin’ Miller yesterday. 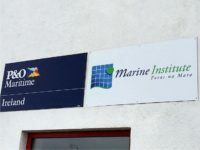 They dropped her off at the #MarineInstitute of Ireland, after loading her up with goodies both from #CFCC and the #Connemara #Smokehouse, and signing her deck with best wishes. Thank-you so much to the Roberts family for taking such good care of our little boat!! The plan is for the Marlin Spikin’ Miller to be deployed by the R/V #CelticExplorer next week, however, there may be an opportunity for a more southern drop-off on an Irish Naval vessel. Stay tuned for further updates!! March 20 - Deployed again! The Marine Institute of Ireland has been actively posting about the Marlin Spikin’ MIller, and our blogpost is up. 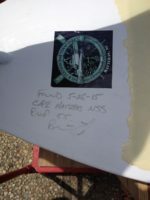 Graham Johnston, Chief Scientist with the Blue Whiting Acoustic Survey 2016 on the RV Celtic Explorer writes:The Marlin Spikin’ Miller is sailing again. We re-launched her from our most south-westerly point. Who knows where she’ll go next. At the beginning of April and as predicted, the Marlin Spikin’ Miller was heading back to Ireland. Our Irish friends are patiently awaiting its landfall. What is really interesting is the similarity between the two tracks. And sure enough on April 12, she’d been recovered!! 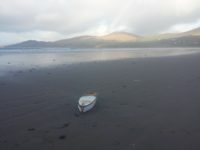 Mick Sheeran, of the Blasket Islands Eco Marine Tour company, and his crew successfully plucked the Marlin Spikin’ Miller off a small, northeast-facing, gravelly beach on Inishvickillane (Inis Mhic Uibhleáin), one of the Blasket Islands on the west coast of Ireland. 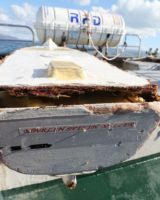 As you can see from the photos, quite a bit of damage was done to the vessel, and the GPS transmitter was compromised and is no longer pinging. Alas, you may think that it is the end for our little boat, but you are mistaken!! Mick and his friends are excited about fixing her up and delivering her to Cobh for her next journey at the beginning of July! We are hoping to get some students from the Galway-Mayo Institute of Technology involved as well. If any of our Irish friends are willing and able to help, please contact Mick Sheeran. 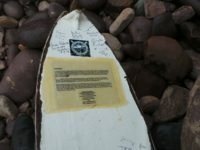 Upon checking my email this morning, I received an email from a gentlemen in South West Ireland on the Dingle Peninsula, Kerry, informing me of a mini-boat discovery. He attached five pictures, all showing the Marlin Spikin’ Miller. 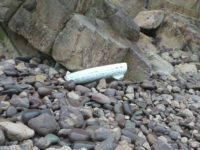 You may recall that April of 2016 was the last time we had heard about the MSM, when it was found by Mick Sheeran, of the Blasket Islands Eco Marine Tour company, after a second redeployment from the west coast of Ireland. My last correspondence with Mick included a discussion of his interest in fixing her up and redeploying her, but I have heard nothing from him since the middle of April 2016. Evidently, he must have redeployed her! 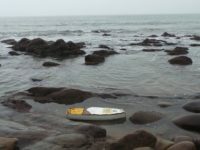 Steve Clark, who found her this morning, relaunched her from the beach at Minard. 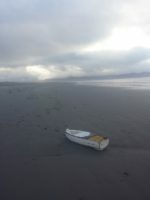 Just moments ago, I received two more emails from people who found her farther east on Inch Beach. One of these individuals has taken her in, and hopes to fix her up.